Latest version: 2.9.0 build 425. April 25, 2019. Data Logger Suite is a full-featured software complex to monitor, log and save any serial data sent or received via RS232, TCP/IP, UDP, OPC, SQL, SMS, Modem or DDE data interfaces. Have you ever thought of a tool that would handle all serial data logging at once without a constant need to reconfigure it or adjust it every time to new conditions? Would it not be great to have a way of monitoring all data sources simultaneously while storing the information into a database in real-time? Could you imagine such tool already exists? 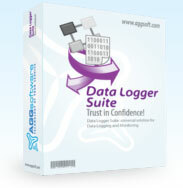 Data Logger Suite is a Swiss knife among other data logger tools. It receives information from any device connected via RSS232, TCP/IP, UDP ports or with an OPC interface, deals with it the way you want, including custom processing and filters, and then stores it to an arbitrary database on your computer. Thanks to the full support of any serial interfaces, Data Logger Suite is truly a versatile solution to monitor any serial data. One of the key features of Data Logger Suite is its ability to question any number of serial interfaces simultaneously and to log information obtained via them concurrently. Data Logger Suite natively supports RSS232, TCP/IP, UDP and OPC protocols and treats them so that working with any of them becomes similar and 100% transparent. The parallel logging of data doesn't require any specific setup and works with any devices connected to these ports, all of them at the same time. Real-time data logging is another extremely important ability. Data Logger Suite monitors all serial data sent to and received from devices and collects information in real-time immediately saving each chunk to a database. Real-time logging ensures you never miss a single bit of data sent from a device, regardless of what interface it is connected to. Once Data Logger Suite captures serial data, it can store them in any database, including MSSQL, MySQL, Oracle, Access, dBase or any other ODBC-compatible database. Moreover, the program can export any data directly into Excel filling a spreadsheet with information on the fly via the DDE interface. Conveniently, Data Logger Suite can process information before writing them to a database which opens virtually unlimited options of filtering, structuring and formatting your data. On-line help. Press the F1 key at anytime and on-line help will appear providing concise and up to date documentation. User-Friendly. Data Logger Suite features an easy to comprehend, thoroughly illustrated interface and therefore it doesn't require any special knowledge to start using it. The flexibility merged with the utter ease of usage and technical perfection provides superior convenience of any task performed with the program. Our Data Logger supplies several cut down versions. Some versions omit some of the advanced features found in the Enterprise edition and is ideal for users who either want a low cost or free solution or are not interested in more advanced features. Read more here.